Korovou villagers before carrying out their mangrove planting and waste management activities for Earth Hour. 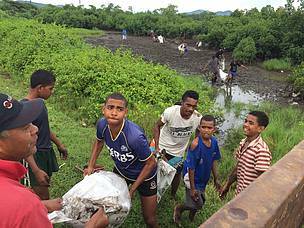 As part of its contribution to Earth Hour this year, 1,500 mangrove seedlings were planted this morning by the community of Korovou village, in Tavua, with the intention to help reduce the community’s risk of coastal flooding and to also secure the community’s livelihood and food security. 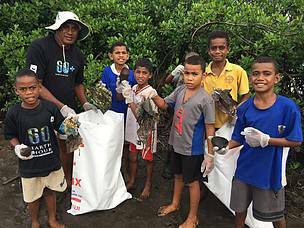 A waste management activity was also carried out in conjunction with the mangrove planting, with both activities being carried out, within and around Korovou village’s mangrove area. 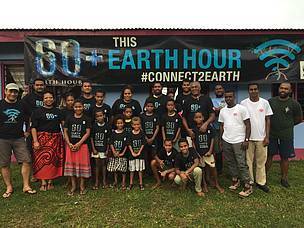 In conjunction with the Earth Hour theme of ‘Connecting to Earth’, WWF Pacific has taken this year’s campaign to Korovou village, one of the communities, WWF Pacific works with in the district of Tavua through its German funded ‘Living with Change: Resilient Mangroves, Fisheries and People of Fiji and PNG’ project. “Korovou and neighbouring community’s participation as well will ensure the ownership of the activity. 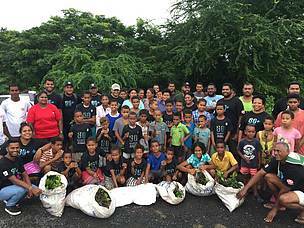 This is a great opportunity to give back to their communities, restore their ecosystem and ensure a sustainable future for their children,” highlighted WWF Pacific’s Community Development Officer, Apolosa Robaigau. For the Korovou community members, the mangrove rehabilitation and waste management activities allows them to take ownership for the betterment not only for the environment but for their future generations. ‘Today’s activity will greatly benefit us through the restoring of the degraded mangrove areas and with this there will be hope for our food security to be restored. The mangrove seedlings once fully grown will also help in saving our community from the impact of flooding in the future,” said Korovou village headman, Akuila Borisi. Corporate stakeholders were also part of the Earth Hour initiative as well, showing their support for the annual global panda campaign. 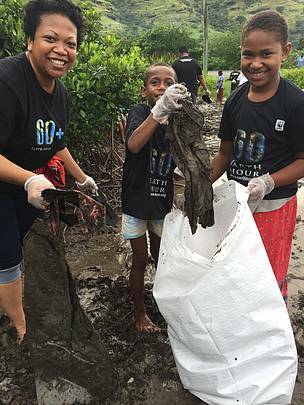 “WWF Pacific acknowledges and appreciates the partnership and contribution from our corporate stakeholders for this year’s Earth Hour initiative through their in kind support and to also just being part of the mangrove planting and waste management activities at Korovou village. These stakeholders include the Tavua Town Council, Punjas Fiji Limited, Flour Mills of Fiji Limited, Fiji Water, and the Tavua Westpac Bank Branch. We are also grateful for stakeholders that have been part of our Earth Hour campaign over the years,” said WWF Pacific’s Great Sea Reef Programme Manager, Alfred Ralifo. Ralifo added that the challenge now is to go beyond the hour. “Everyone can make a difference. Every Hour should be earth hour. Simple things such as turning off your lights and appliances when you don’t need them to conserve power to planting a fruit and vegetable garden in your back yard or planting as many native tree species and mangroves as you can. You could even try to buy more locally produced food and to support our economy. These are small contributions that can be made and collectively will have a big impact,” highlighted Ralifo. This year’s earth hour is about shining a light on nature and all of its biodiversity and associated ecosystems which underpins our sustainable development aspirations while adapting to and mitigating the impacts of climate change. Connecting to earth is an opportunity of reflect on the important value of our unique biodiversity that is fast declining and to make strong commitments as an individual, as a family , a community, a company, a town, a nation and one planet to halt the decline in biodiversity and reverse the trend through sustainable practices and circular economy. Korovou villagers with stakeholders before the mangrove planting activity. (L) WWF Pacific Volunteer, Arieta with two Korovou village children collecting rubbish.